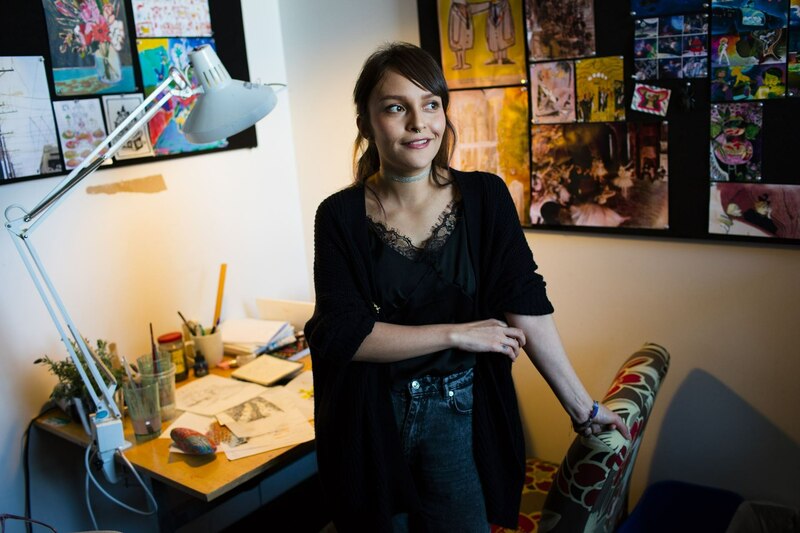 Ana Ramirez — who I met when we were both studying Experimental Animation at the California Institute of the Arts — earned herself an internship at Pixar Animation Studios, and has now worked as a Visual Development Artist on the studio’s newest film, Coco. 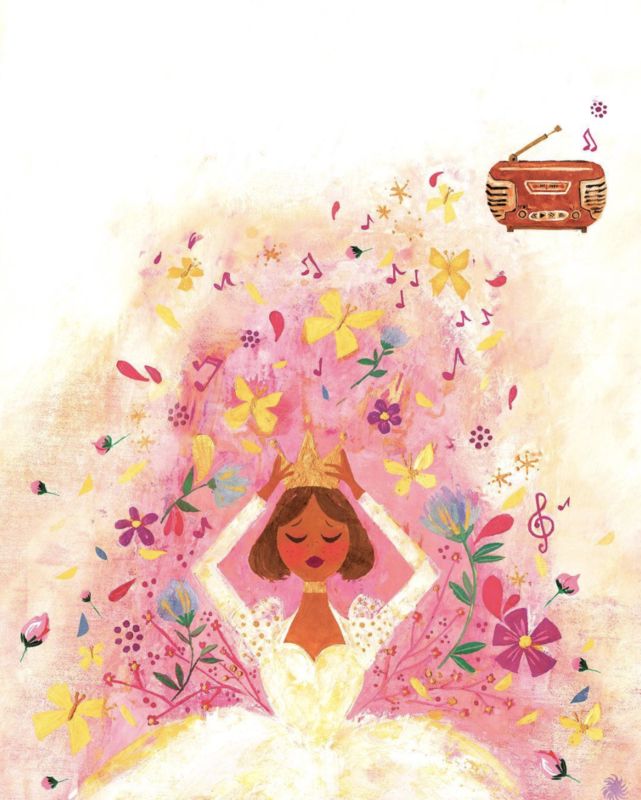 Ana also illustrated the Disney book based on the movie, Coco: Miguel and the Grand Harmony, which is available in both English and Spanish! One of my favorite memories of Ana involves preparation for a much-anticipated portfolio day, when all the big-wig studios come to campus to scout local talent. At the time, Ana’s mom was in town and she put all her being into helping her daughter get her drawings together. That was a moment that stuck with me, as I related to having a Mexican mom who worked hard to help me with my career. I recognized the type of undying love that, for me, is associated with Mexican culture. Ana Ramírez is photographed on February 16, 2017 at Pixar Animation Studios in Emeryville, Calif. 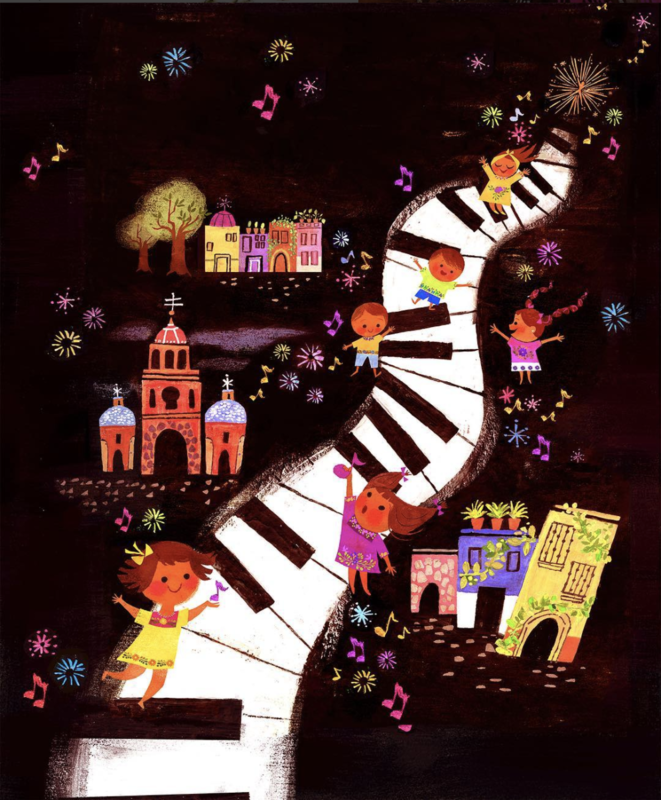 In Coco: Miguel and the Grand Harmony, written by Matt de la Pena, Ana’s drawings come to life with vibrant textures, pages that flow like music, and familiar characters who embody the magic of Mexico’s culture. To learn more, we spoke to Ana herself. HelloGiggles (HG): Can you talk about your background with illustration and how you had only been drawing for a few months before applying to art school? 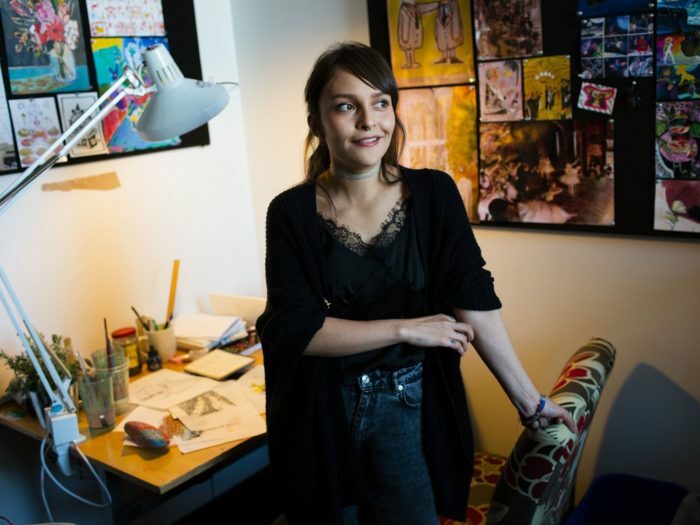 Ana Ramirez (AR): I didn’t really draw growing up. My sister was the more artistic type, so I always wanted to try to find my own thing. My mom was an artist, too (she studied floral design and is now a wedding planner), but she encouraged me to take a drawing class during my last year in high school. I wanted to play guitar and apply to music school, but wasn’t very dedicated. It was sort of against my will to take the drawing class she recommended, and I really didn’t want to go, but I think they wanted me to try out other things before applying to music schools. I ended up really loving life drawing and taking drawing classes the rest of the semester. I went 3 days a week for 4-5 hours every day, and decided to apply to CalArts but didn’t get in! I sent in a notebook with sketches and didn’t really know what a portfolio was supposed to look like. So I spent the next year taking art classes in everything — watercolor, comics, illustration — and worked on my portfolio non-stop. When I reapplied to CalArts, I got into both Character Animation and Experimental Animation, but decided on Experimental. It felt more open and gave me more options — like I could take more classes in the theater school, too. HG: What role did you have in the new Pixar movie, Coco? AR: Visual Development Artist. I was one of the concept artists, but what was really cool was that I was able to get so much more exposure working on this movie because I’m Mexican, and this movie was about Mexico and Mexican culture. I had the chance to work more with the production designer, who trusted me to do a little bit of everything, like sets, characters, costumes, translation, and cultural consultation. Also, because of that same exposure, I was able to illustrate the Disney book. HG: How did you get to work on the book? AR: I had expressed my interest in illustration for Pixar when I met someone in publishing, around when I started my internship back in 2013. It came up in a meeting. They sometimes get freelance artists who don’t necessarily work at Disney, but the production designer Harley Jessup recommended me and asked me to make the official book for Pixar. I was like WOW! My dreams are coming true, and I was super excited. I started working on it right away. I never actually got to interact directly with [writer] Matt de la Peña, but I’m meeting him for the first time at a book signing at Pixar. It was a really fun project to do. HG: The illustration compositions feel rhythmic, like a musical composition sheet. The vibrant textures also remind me a lot of the colors you see in Mexico. What were some of the materials that you used to make this happen? AR: That was actually the work of metallic gouaches. Everything I used was gouache. Then I composited in Photoshop. For those vibrant colors, I got different colored gouaches like watercolor, primary, and metallics like the silver and gold. I love the metallic ones that look like gold leaf. I would draw and paint the background separately from the characters. I used an illustration board for everything and scanned them all in. HG: I had no idea this was all done on paper! Were you listening to any music while you were illustrating the pages? AR: Yeah, actually, I listened to a lot of mariachi music because I wanted to get the vibe and feel inspired. HG: Is the book based on a certain time period or city? 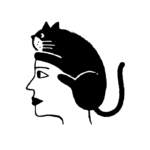 Did real people inspire the characters? I love the drawing of Mama Coco in the book — she reminds me of what my grandma looked like — so tiny. AR: Aw so cute! The book is mostly a side story from the movie. It’s supposed to be a day in the life of, and another view of, Miguel and how he feels about music. The research that we did was mostly in the cities of Oaxaca, Guanajuato, and Morelia. But personally, I based most of it on Guanajuato, which is my hometown, and I wanted to represent. There’s no time period, but I would say it’s pretty modern. Most of the characters are designed from the film, and the others are based on people we saw or have seen in the reference photos we took. HG: There are more female musicians illustrated in the book than are typically represented in pop culture. Can you talk a little bit about this? AR: Yes! That was on purpose. I thought there should be more 50/50 representation. 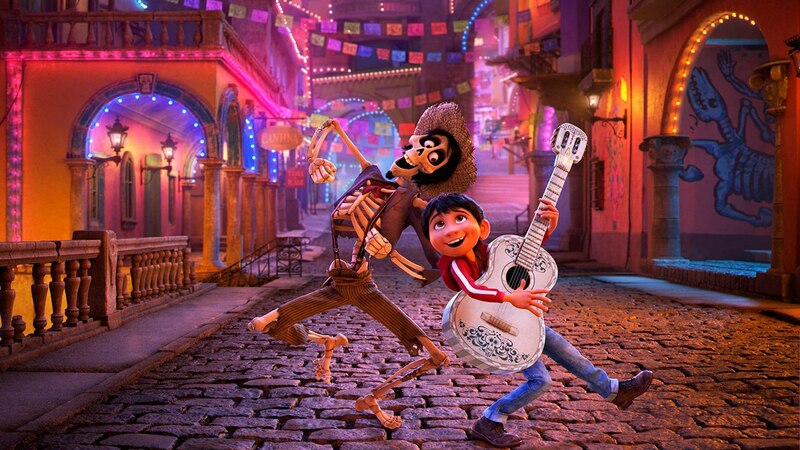 Especially because the story is already about a boy, Miguel — even though there is Mama Coco, it’s really about Miguel’s experiences. I wanted to make it feel more even in the book. HG: What were some of your favorite children’s books growing up? AR: Miroslav Sasek, he’s an illustrator. The Madeline book and cartoon series. The Princess and the Pea was really cool! HG: My last question: Why should people go see Coco? AR: Oh! ‘Cause it’s awesome! It was done respectfully. We tried to be accurate and represent Mexican culture in a way that would make Mexicans feel proud, and so other people could understand our culture. Just watching it, I hope it will open the doors for studios to make more cultural films. 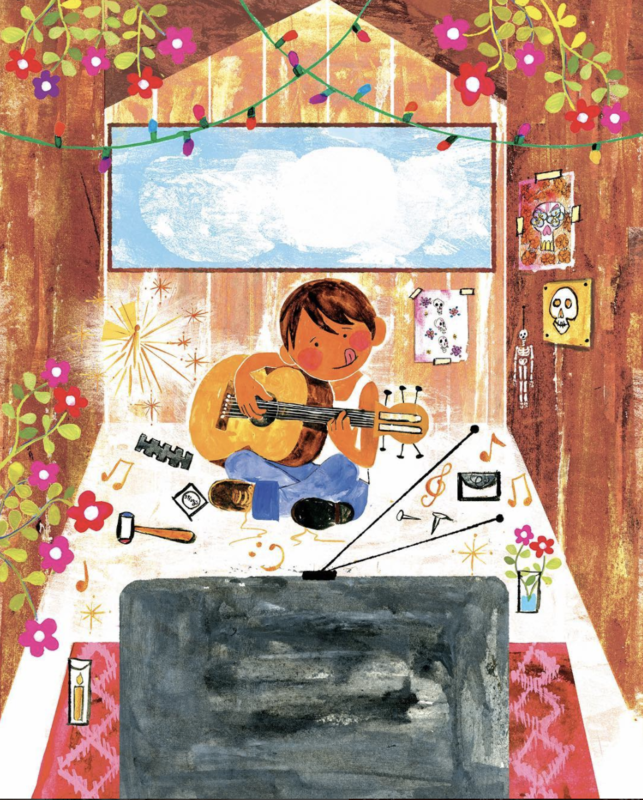 You can find Ana’s illustrated book (in English or Spanish!) for purchase here on Amazon or at the Disney bookstore.